This is an artist's conception of the binary system 2M J044144 showing the primary brown dwarf that is estimated to be approximately 20 times the mass of Jupiter (at left) and its companion that is estimated to be 7 times the mass of Jupiter (at right). Last edited by Old Timer; 08-13-2010 at 02:27 AM. 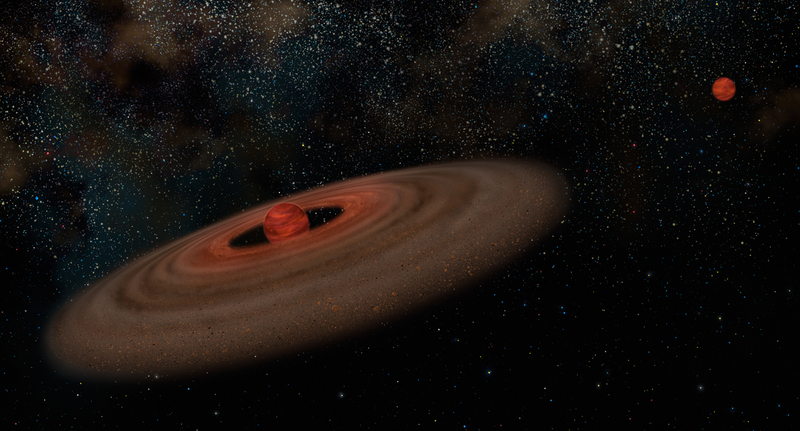 A Brown Dwarf moved into the Galaxy? Well there goes the neighborhood not to mention Planetary property values. Time to pack up and move. Could you possibly tell me a good time of the year to buy the tickets? I want to make sure the weather is real nice. I dont want to go when its rainy or something. So if you discovered a new planet, what would you name it? Why OT's place of course. I think Pluto would be a good name. Especially since some group of eggheads decided that Pluto wasn't a planet anymore. I'm sure they had a valid reason, like it was too far away or maybe too cold or small, but I still miss it. Now that it isn't a planet anymore, there might be a whole bunch of frozen Ewoks or something just beside themselves with grief because they're no longer members of our prestigious solar system. Who's going to invite them to dinner parties now? Yep, that's me alright. A very modest man indeed. Yep, I noticed it a long time ago. Well I will trade your frost for all of our snow--20 below wind chill and 10 below temperature this morning. Would there be Christianity On Another Planet?